Proper skin salting is the first step toward a beautifully tanned deer hide. Salting a deer hide is one of the best ways to temporarily preserve the hide before tanning. 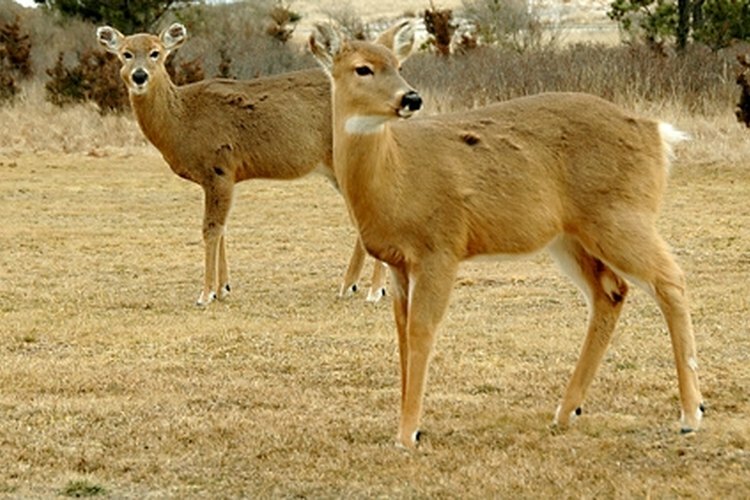 If left untreated, bacteria rapidly deteriorate a deer hide. Salting pulls moisture from the hide, keeps the hide from rotting, prevents hair from falling out, repels flies and breaks down proteins in the skin which aids the tanning process. Salting a hide is a quick and easy process that goes a long way in ensuring you end up with a quality deer hide. Trim any remaining pieces of flesh or fat from the deer hide after skinning. Spread the deer hide flesh-side-up on concrete or an old table. Roll out any corners that try to curl. Sprinkle plain, uniodized salt liberally on the hide. Work the salt into the hide with your fingers. Make sure you work salt into all fleshy areas. Hang the hide in a well-ventilated, low-moisture area to dry. Make sure air can circulate freely on both sides of the hide. Place a garbage can or plastic tote under the hide to catch the moisture the salt pulls out of the hide. Let the hide dry for a day. Brush off the salt outside and dispose of the used salt. Dispose of the drained fluid and rinse the container. Reapply a second coating of salt. Keep reapplying, hanging and removing salt until no more moisture drains from the hide. A deer hide typically takes two to five coatings of salt. Store the hide in a cool, dry place away from bugs until the hide can be tanned. It's best to tan the hide as soon as possible after salting. It takes about 5 pounds of salt to coat a deer hide once. Let the deer hide dictate how much you need and don't be afraid to use more or less salt. You can get plain salt in bulk from feed supply stores, which will save you money. Don't work on a table you want to keep clean, such as a kitchen table. Don't work on the ground where the hide could get dirty. Don't hang the hide in a basement or damp place to dry or for storage. You can store the hide for a few weeks, but check it frequently so it doesn't spoil or become a haven for insects.